Heavy hearts at the UN. Just coming back from staff briefing on Haiti. A colleague I know survived but the disastrous earthquake is the biggest single loss in UN history and probably the biggest disaster the UN has dealt with. A video showed shocking damage in Haiti and first hand reports of Haitian colleagues were heartbreaking. 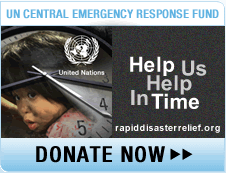 Secretary-General called the international response overwhelming and an act of love. It will take years for the people to get back on track.